Fear is a distressing emotion caused by impending danger or pain whether the threat is real or imagined. The individual experiencing fear can recognize the person, place, or thing precipitating this feeling. Some of the most common fears are fear of death, pain, and bodily injury. Other fears are derived from a person’s life experiences. Culture, age, or gender affects how fear is expressed and managed. Fear may be unacceptable to some cultures but may also be freely expressed and accepted. One’s individual ways of coping, however, may be cultural as well. Magic, mysticism, or religiosity may be used in some cultures to control fear. 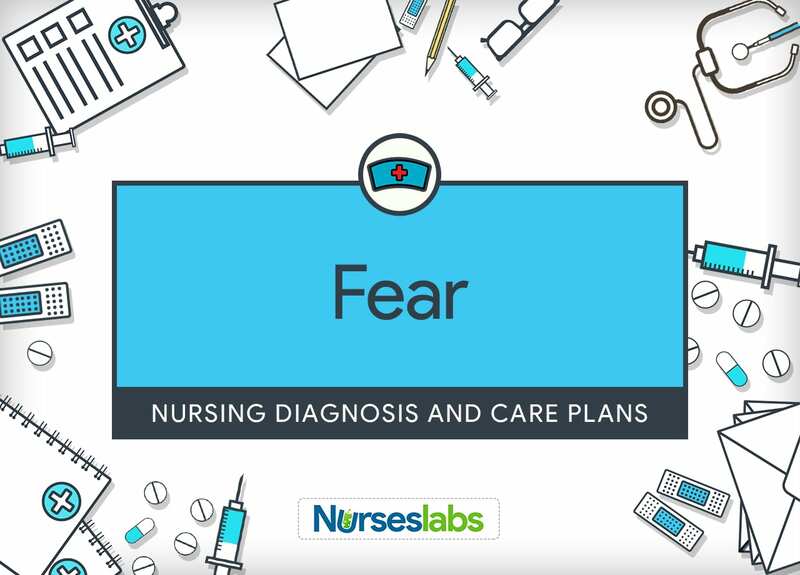 Most common examples of fear a nurse encounter are a fearful patient in the community, a patient may also have fear during diagnostic testing in an outpatient setting, or during hospitalization. The nurse’s role is to identify when patients are experiencing fear and must find ways to help them in a respectful way to face these feelings. The nurse must also learn to distinguish when fear becomes persistent and pervasive that it affects the individual’s ability to perform his or her activities of daily living. Referral to a reliable support system and programs increase the chances of successfully managing, treating, and overcoming phobias and other fears. Patient uses effective coping behaviors to reduce fear response. Patient states accurate information about the situation. Patient identifies, verbalizes, and demonstrates coping behaviors that reduce own fear. Patient reports and demonstrates reduced fear. Assessment is needed in order to identify possible problems that may have lead to Fear. Determine the type of the patient’s fear by thorough, rational questioning and active listening. The external cause of fear can be known. Patients who find it unacceptable to expose fear may find it convenient to know that someone is willing to listen if they choose to share their feelings at some time in the future. Assess the behavioral and verbal expression of fear. This information provides a foundation for planning interventions to support the patient’s coping strategies. Evaluate the measures the patient practices to cope with that fear. This information helps determine the effectiveness of coping strategies used by the patient. Learn to what extent the patient’s fears may be influencing his or her ability to function. Anti-anxiety medications or referral to specially designed treatment programs is necessary for persistent, immobilizing fears. Patient safety must always be a priority. Open up about your awareness of the patient’s fear. This approach validates the feelings the patient is holding and demonstrates recognition of those feelings. Discuss the situation with the patient and help differentiate between real and imagined threats to well-being. This approach helps the patient deal with fear. Tell patient that fear is a normal and appropriate response to circumstances in which pain, danger, or loss of control is anticipated or felt. This reassurance places fear within the field of normal human experiences. Be with the patient to promote safety especially during frightening procedures or treatment. The physical connection with a trusted person helps the patient feel secure and safe during a period of fear. Maintain a relaxed and accepting demeanor while communicating with the patient. The patient’s feeling of stability increases in a peaceful and non-threatening environment. Familiarize the patient with the surrounding as necessary. Familiarity with the setting promotes comfort and a decrease in fear. Provide accurate information if irrational fears based on incorrect information are present. Replacing inaccurate beliefs into accurate information reduces anxiety. If patient’s fear is a reasonable response, empathize with him or her. Avoid false reassurances and be truthful. Reassure patients that asking for help is both a sign of strength and a step toward resolution of the problem. Use simple language and easy to understand statements regarding diagnostic procedures. The patient may find it hard to understand any given explanations during excessive fear. Simple, clear, and brief instructions are necessary. Maintain a quiet environment whether at home or in a hospital setting. Drop any unnecessary stuff around the patient. Patient’s fear is not reduced and resolved if the environment is unsafe. Provide safety measures within the home when indicated (e.g., alarm system, safety devices in showers or bathtubs). Patient’s fear will not be reduced or resolved if the home environment is unsafe. Support the patient in recognizing strategies used in the past to deal with fearful situations. This method allows the patient to think that fear is a natural part of life and can be dealt with successfully. As the fear subsides, encourage the patient to involve himself or herself to specific events preceding the onset of the fear. Recognition and explanation of factors leading to fear are vital in developing alternative responses. Allow the patient to have rest periods. Relaxation improves ability to cope. The nurse needs to pace activities, especially to older adults to conserve the patient’s energy. Suggest the patient to bring comforting objects when away from home. This method can enhance feelings of security in a new environment. Access community resources to meet the fearful needs of the patient and family (e.g., spiritual counselor, social worker). Appropriate resources render organized and regulated patient care that indicates supportive healthcare service. Initiate alternative treatments. Provide verbal and nonverbal (touch and hug with permission) reassurances of safety if safety is within control. Meditation, prayer, music, Therapeutic Touch, and healing touch techniques help lighten fear. Refer to cognitive behavioral group therapy. A reward that comes from participating in a group is the opportunity to meet others with the same problem. Even if not everyone will have the same triggers or severity of symptoms, it is helpful to know that the patient realizes that he or she is not alone.